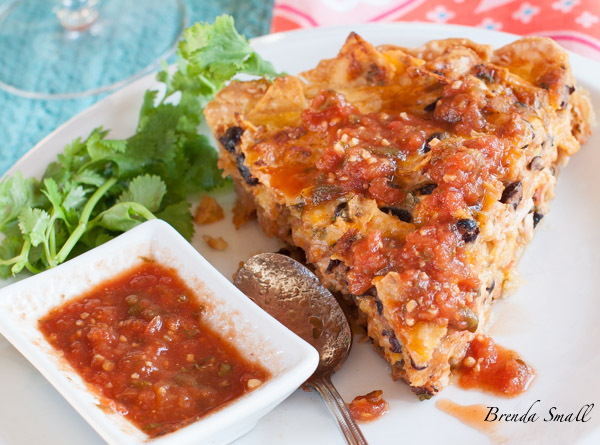 This hearty Texas Style Quiche uses 2 types of cheese, salsa, black beans, eggs, chicken, tortilla chips and cilantro. 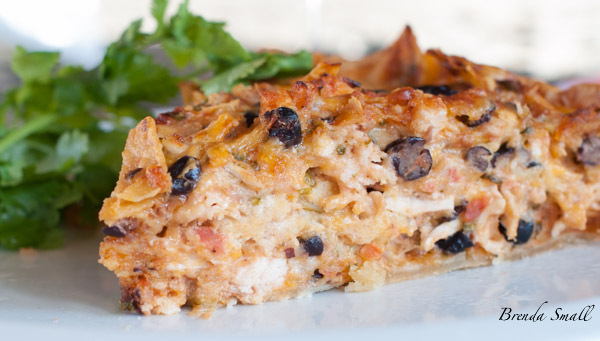 The texture is much more dense and hearty than “girlie type” quiches. I think even guys would love this one. Add a salad or a soup, and you have a great meal. If you lived in Texas, you could be having dinner on the patio as we did last week. This, along with a salad and a glass of wine, was a great dinner for an al fresco evening. It was an amazing evening for February! I had some friends over to play canasta in November, and made a “fallish” style lunch….a Texas Style Quiche, Avocado and Grape Tomato Salad and for dessert, Pumpkin Dessert Squares. As we were indulging in the Pumpkin Dessert Squares, the discussion was centered around how fall/winter food is truly comfort food. At that moment, I realized I am sooo into the fall/winter menus….soups, stews, roasts and curries….simply heavier foods than you would typically serve in warmer weather. I love to cook outdoors any time of the year, but in the cooler months, my indoor, “low mileage” stove and oven get a few more miles put on them. I was raised in Weimar, a small, central Texas, country town, population 1,500. As my mother was a true country cook, she cooked 3 large meals every day: breakfast – meats, biscuits, pancakes, waffles and eggs; lunch: (my dad always came home from work and my sister and I almost always came home from school for lunch) 1 or 2 meats, 2-3 veges and dessert; and dinner was a repeat of lunch. 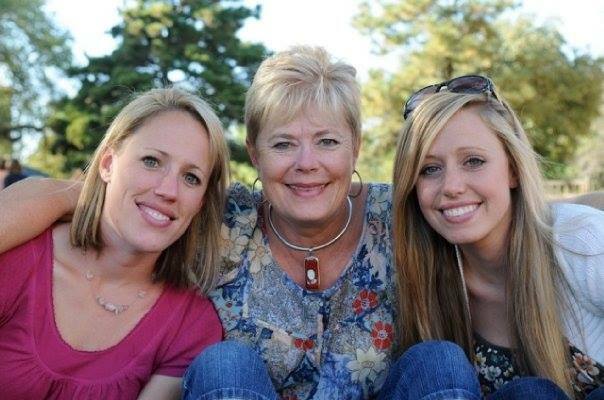 As my sister, Suzann, cooks a lot like my mom, I think I must be the first generation of “Seasonal Cookers” in my family. 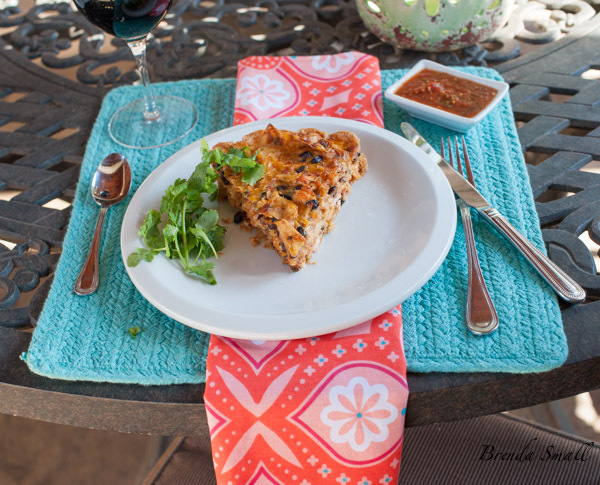 I found this quiche recipe in the Dallas Morning News about a year ago. 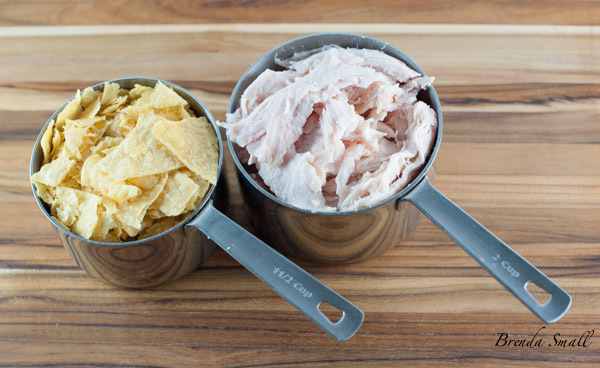 I’ve served it to several of my Canasta groups with rave reviews each time. Some men are not big quiche eaters, but I must say, Joel actually liked this one. I think the Southwestern flavors and the texture had him on the first bite. This quiche is also much more hearty than most quiches. It’s not as eggy as most. It has a much more dense texture. Of course, I had to change things! The original recipe called for chunky salsa with cilantro. After much grocery store shelf searching, I was able to find some Pace’s Salsa with Cilantro, which I used the first time I made the quiche. As it is difficult to find; I now just use Pace’s Thick and Chunky Salsa or my new favorite salsa…Mateo’s Gourmet Salsa and add fresh cilantro. If you can find the salsa with cilantro, you can use it and leave out the fresh cilantro. Even though using the salsa with cilantro is easier, I don’t recommend it as the quiche has a much better flavor with the fresh cilantro. That is my opinion…and I’m sticking to it! 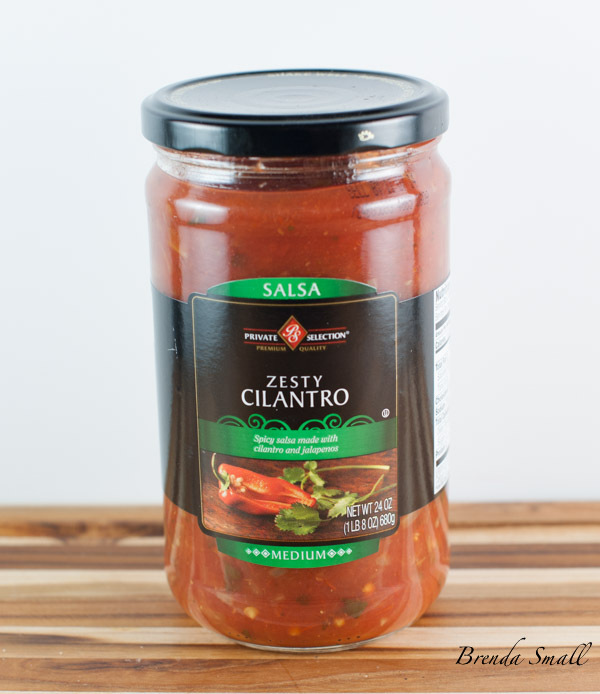 Last week, I found this Zesty Cilantro Salsa at Kroger…another option. This is a perfect entree for entertaining. It is quick and easy to put the ingredients together. Then, it bakes in about an hour, which gives you time to play a game or two of cards or visit with your friends before you eat. All you need to serve with it is a salad and a dessert. 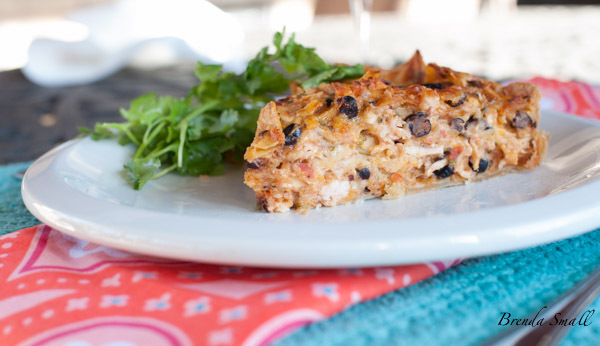 It would also be great for a fall or winter dinner (if your husband will eat quiche) served with either a salad or a soup. 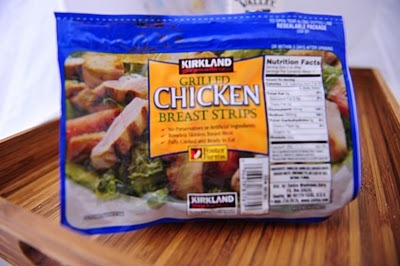 I always used these Precooked, Grilled Chicken Strips from Costco, that is, until I didn’t. When they started carrying their Rotisserie Shredded Chicken Breast Meat, I became a loyal user. 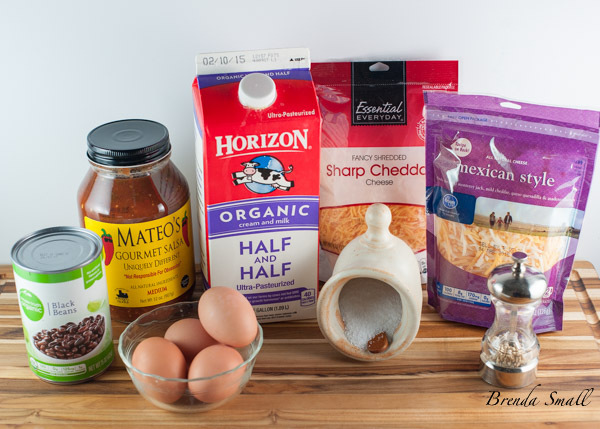 These are the ingredients you will need to prepare the Texas Style Quiche. I buy all of my organic beans at Kroger Grocery Stores. Their Simple Truth Organic brand is high quality and reasonably priced. My family’s new salsa addiction is Mateo’s Gourmet Salsa. It has a great, fresh flavor and it is locally made. I purchase it at Costco, along with the organic eggs and the Horizon Organic Half and Half. This is the size I like to shred the chicken and crush the tortilla chips. I prefer the Pillsbury Pie Crusts that come in a box of 2. After reading many articles on GMO’s, I am pretty sure they are bad for us. I’m now trying to use as many organic products or products that have the NON GMO label on the packaging. 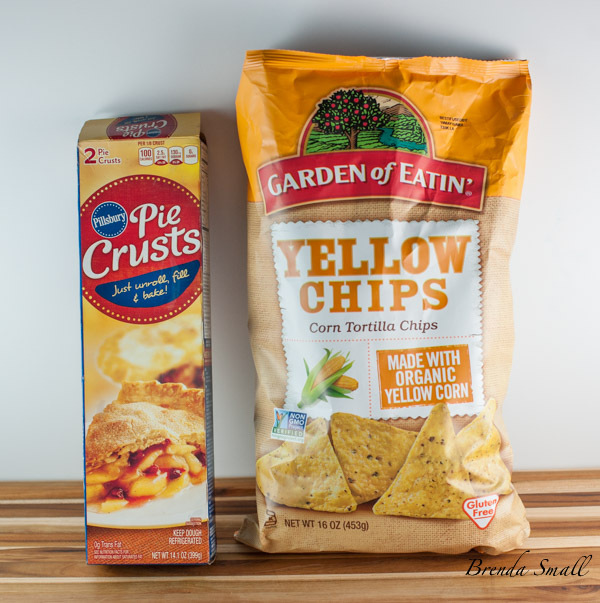 I prefer the Garden Of Eatin’ brand Tortilla Chips. Their Blue Corn Tortilla Chips are also great. I love this 10″ Wilton Professional Quiche/Pie Pan. 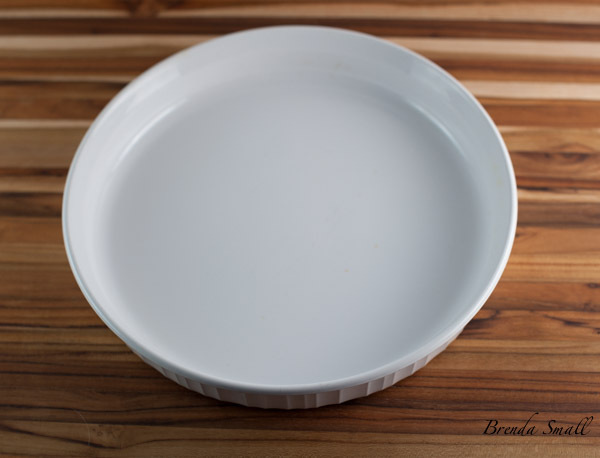 It’s a really versatile pan that I use often. This recipe fits perfectly into this pan. If you are using a smaller pan, this recipe will make 2 quiches. Lightly press the crust into the pan to cover the bottom and the sides. With a fork, poke lots of holes in the bottom and sides of the crust to avoid the crust bubbling up. 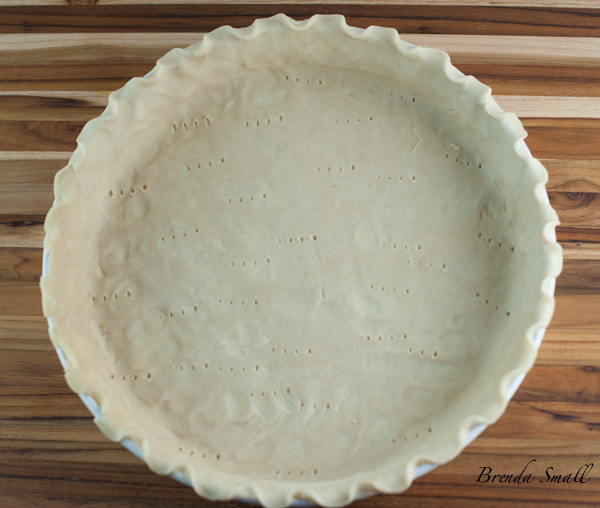 Decoratively crimp the edges of the crust. I prefer baking the crust for about 5 minutes before adding the filling. It is my contention this keeps the crust from getting soggy when baked with the filling in it. This is what you should see! 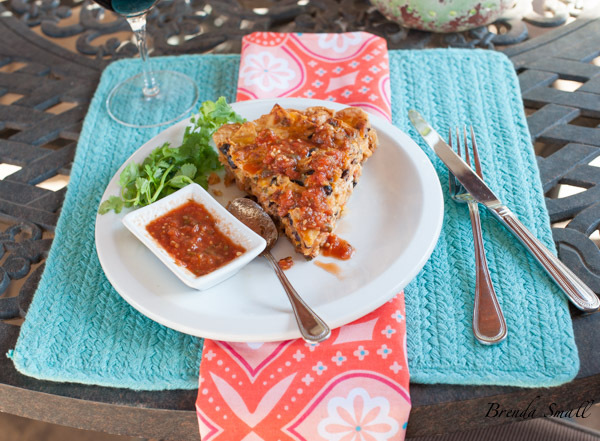 A perfectly baked Texas Style Quiche. To check for doneness, insert a dinner knife into the center. It should come out with just a few moist crumbs clinging to it. Enjoy…and I hope your guests enjoy!! Please leave comments or questions below. I look forward to hearing from each of you. 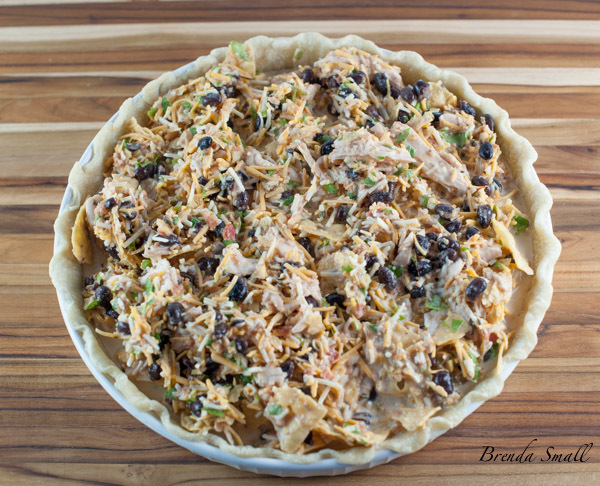 With a fork, poke lots of holes in the bottom and sides of the crust to keep it from bubbling up. Bake the crust in the preheated oven for 5 minutes. Remove from the oven and set aside. Cool at least 10 minutes before adding the filling. In a large mixing bowl, beat the eggs with a wire whisk until slightly frothy. Whisk in the half-and-half until well blended. Stir in the chicken, tortilla chips, cheeses, salsa, black beans, cilantro, salt and pepper. Pour the egg mixture into the slightly baked and cooled pie crust. 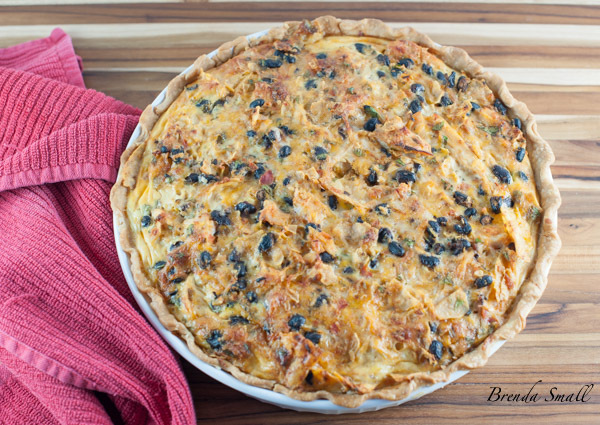 Bake in the preheated oven for 55 to 65 minutes, or until a knife inserted into the center of the quiche comes out with just a few moist crumbs clinging to it. Allow the quiche to sit 5-10 minutes before cutting and serving. 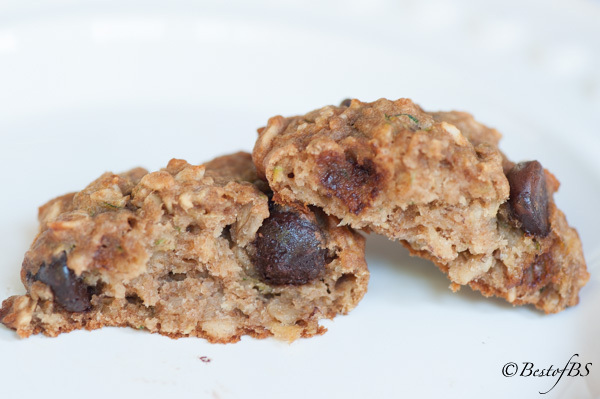 Either serve hot or bring to room temperature, cover tightly and then refrigerate or freeze. 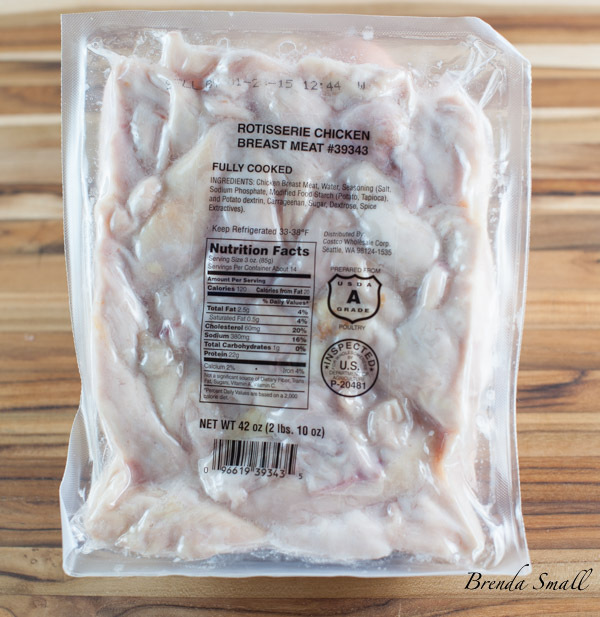 When ready to serve, remove from the refrigerator or the freezer and bring back to room temperature. Microwave until heated. May serve with sour cream and salsa on the side and cilantro for garnish. I made this last night for a Marathon Canasta match. All of us thought it was delicious! Glad you guys all enjoyed it. Thanks for the comment!